Long before the game's release it was said by Killzone's Steven Ter Heide that Killzone: Shadowfall would be receiving co-op content, but not for a while. As of today Sony has officially announced the release date of the next DLC, Intercept, which will be including the long awaited co-op gameplay. Intercept can be expected for a June release and will be free for Season Pass holders. It has also been announced that later in the year a co-op standalone copy of Killzone will be released. The co-op experience will begin with your team, an elite VSA squad named Intelligence Squad Alpha. There will be four classes to play in-game, Marksman, Medic, Tactician and Assault. The classes will have to work together in order to make the best of all their abilities. Marksman and Assault will be your combat roles, Assault being your close quarters fighting and Marksman being your ranger. Medic will be the teammates that keep your team alive, and Tactician would seem to be what will keep your team stocked with ammo and possibly other goodies, although I'm not certain about that one. Your goal is to keep the ongoing Helghast hordes back as your defend your Uplinks used to send intel back to your HQ. Your Team Score will be what tells you how close you are to setting up an Uplink, but be weary, dying and losing Uplinks will cause you to lose Team Score and if your team was to die without enough Team Score to respawn it would be a mission failed. In order to make sure your Team Score stays strong you'll need to increase it as a team by defending your Uplinks from attempted captures by the Helghast, getting kills, actively using your class ability and recapturing lost objectives. The Helghast will be completely AI-controlled, and will have their own combat roles as well. As the battles rage on they will change up their tactics requiring you to improvise for the situation. The Helghast will also be able to call in Helghast champions based on main characters from the campaign which will be armed with special abilities. Personally I'm really looking forward to this DLC and I'll be playing a lot more Killzone: Shadowfall once co-op is released. 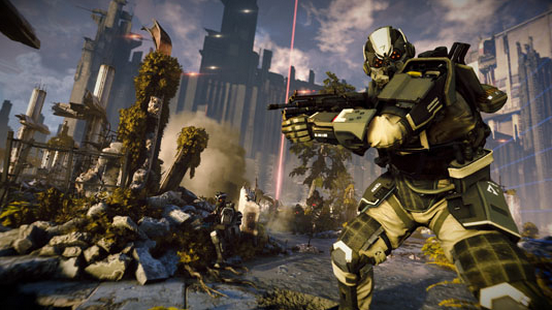 What do you think of the upcoming co-op content for Killzone?